From the Instagram page, "The Refugee in Me." 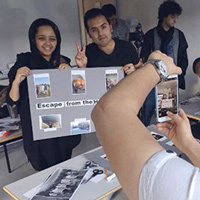 Through a semester-long collaboration, Webster University students at the Geneva campus joined with local refugees to promote a true reflection of the refugee crisis through media storytelling and cultural integration. As they met weekly with students from September to December, refugees learned the basic structure of storytelling and discovered their own voice. 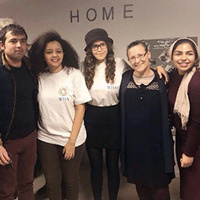 Hosted by the Webster Humanitarian Association, students worked alongside them, using media as a platform to raise awareness of refugee issues. "Home to Home" exhibit Dec. 7. The collaboration included an exhibit, "Home to Home," on Dec. 7 where refugees told visual stories of their journey, revealing where they came from and how they are currently living. Throughout the semester, Webster students also hosted social events to better integrate refugees, ranging from cultural recipe exchanges for thanksgiving to a movie night of a popular Bollywood film from their region. Read more in the full story at Webster Geneva.